A couple of months ago, I helped throw a baby shower for one of my best friends. My duties were extremely simple: drinks, dipping implements for the chocolate fondue, and diapers. I saw this great idea on Pinterest to have the guests of the shower write bits of advice for the mom-to-be on diapers for her to read during those (NUMEROUS) diaper changes. I wanted the diapers to be ones she could actually get a good use out of and so of course, I went straight for Pampers. At my own baby showers, moms of all ages with kids of all ages all swore by Pampers as their go-to brand of diaper. 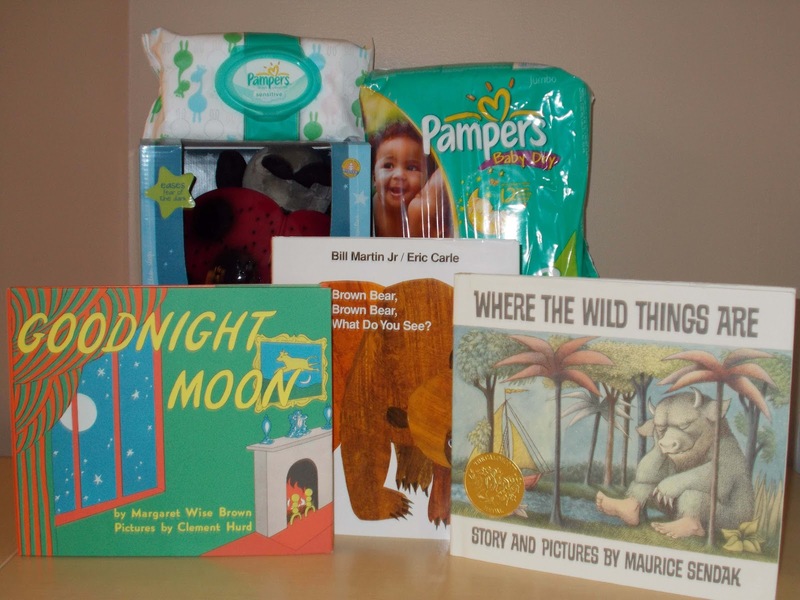 We were given countless diapers at our showers and we also made sure to stock up a bit before The Incredible Hulk made his appearance, but immediately we saw the difference in the quality of other diapers to Pampers. I recommend Pampers to all New Moms for one small, but very important reason - SLEEP. By far, the most jarring thing you experience in the first few weeks of motherhood is the enormous lack of sleep that follows. So, when your precious babe starts to sleep for long stretches, the very last thing you want is for them to wake up because they have soaked through their diaper. Pampers Baby Dry is your number one defense for this. We diapered TIH in them all day long knowing that if he fell asleep and took an extra long nap, we'd be okay even if his diaper hadn't been changed for a few hours. We're on the road to potty training any day now (or so I like to delusionally tell myself), so I'm enjoying the time that we can rely on a good brand of diapers for the comfort of our kiddo and the extra hours of sleep (for all of us.) So, in the meantime - I know I have Pampers in my corner. - For one bonus entry, you can follow me on Pinterest where I am obsessively pinning great ideas for kids, DIY, and food. (Mostly food.) Just leave an additional comment saying that you've started to follow my madness. The contest will shut down Thursday night at 7:00 pm CDT at which point I will randomly select a winner from the comment section and announce it here on the blog on Friday, May 3! And be sure to check back on Wednesday where I will be offering up another opportunity to win this awesome giveaway as well as some of the best sleep advice I've ever heard from my very own godmother! Good luck to all who enter! Hope to see you back on Wednesday! Though the lovely folks at Pampers provided me with the Pampers Baby Dry Sweet Sleep Time Gift Pack to giveaway on this blog, the opinions expressed are my own. I truly have always been a huge fan of their product. Okey dokey. So my advice is to watch "The Happiest Baby on the Block" DVD (the book was fine too but the DVD has all the same info, it was faster, and you get the visual). When my husband and I watched we actually paused it several times to stare at each other in amazement at the magician, Dr. Karp. Not only was swaddling a complete Godsend, but the concept of the fourth trimester really changed the way we thought about newborns and helped us in other areas as well. If you want to swaddle though you really need to start out early. At first the baby resists, but Grace came to love it in less than a week. Also, I eventually figured out that even little tiny babies need naps. I had always just seen them sleeping wherever and whenever so it was pretty revolutionary when I started putting her down three times a day. I would suggest reading "The Baby Whisperer" just for the E.A.S.Y. method. Last thing, A WHITE NOISE MACHINE. It reminds baby of the womb and drowns out other noises that might wake her up. Ours was one from Radio Shack that my MIL was going to donate to Goodwill. It is absolutely priceless. OOh, i agree with THBOB. Those 5 S's will take my son from cranky screaming baby, to sleepy silent baby. The hubby is upstairs right now "shushing" my baby boy to sleep. I liked you on facebook! The best advice I got is to run a humidifier and stick to a routine so the baby knows its bedtime! Ah, Pampers are a favorite in our house as well! Have been since day one. You forgot to mentioned for sizes 1-2 how they have those colored stripes that turn colors when they pee (my absolute favorite). My advice would have to be consistency is key to getting on a sleep schedule, and let them cry it out sometimes. ALSO, one of the sound soothers and a star light. My son LOVES his star light. I'm a new Facebook fan (Mary Happymommy). The best advice I got was to run a white noise machine to drown out outside noise. The best sleep advice I got was to ignore all of the sleeping advice and do what is best for you and your baby! Start a routine, swaddle and noise machine, also to trust your gut and do what you need to do, nothing will be perfect! The best advice I got was to swaddle and to just do what you need to do to survive! I'm only 2 months into my journey through motherhood, but with those two pieces of advice, I've gotten more sleep than expected! I'm also a fan on FB and follow your pinterest boards. Following you on FB now! Top read 12 hours by 12 weeks. MIRACLE. And dag I need me some free diaps, yo. Ha! We're in the middle of night weaning, so my best sleep advice might be different in a week! So far the best has been to have a routine for bedtime and get Dad in on it. Swaddling was also a huge help. I also have to try the advice of going up a size on our Pampers to help prevent leaks. Think we need to try that one next time we buy! I'm already FB fan and I think I am now following you on pintrest. I like you on Facebook :) Best sleep advice came from the book: "Good night, sleep tight" by Kim West...gentle sleep training. It worked wonders with both of our girls! And now I follow you on Pinterest!! I like you on facebook...and, change baby in the middle of the night when she wakes for a feeding. Then you can put her down dry and full! AND, I think the title means that even though the fear is taking the wheel, YOU have to steer. Try to get things going the direction you want them to. Now gimme some diapers! The girl has NO interested in the whole potty thing. Greetings from another working mom who appreciates your perspective! The best sleeping advice we got was ROUTINE: bath, pajamas, story time, night cap :), zzzz. We also loved using the Miracle Blanket to swaddle our little one for the first few months. it's very difficult to get that "perfect balance" between user friendliness and visual appearance.